“A game for long distance driving. Silos, Windmills, Graveyards is an exhibition of photography and sculptures that extract the remarkable from the ordinary through found materials, records of the past, and imitations of quotidian structures. Kensington’s artist-run gallery High Tide brings together four artists from near and far – Sophia Belkin, Matt Kayhoe Brett, Clark Mizono, and Izaak Schlossman – to generate a conversation regarding the value of happenstance and the abstraction of lived experience. Silos, Windmills, Graveyards presents a metaphor for the making process via the framework of a road trip game, in which the player wins and loses points based upon the highway landmarks they spot. The long-distance road trip is a recurring theme in American literature and cinema, often featuring characters in search of great change, a new sense of self, or in pursuit of a dream. In their efforts to escape the mundane these fictional journeys are often punctuated by obstructions. For example, the classic “sputtering engine, plume of smoke, and lift the hood” radiator malfunction, which always seems to occur in the middle of the most desolate stretch of highway known to man. Or perhaps the archetypal hitchhiking scenario enacted by a desperate but daring lead character. These plot developments operate to make eventful a process that is positively dull – the hours spent driving. Creating games such as the one described in this exhibition is another way to create landmarks of excitement in times of monotony. 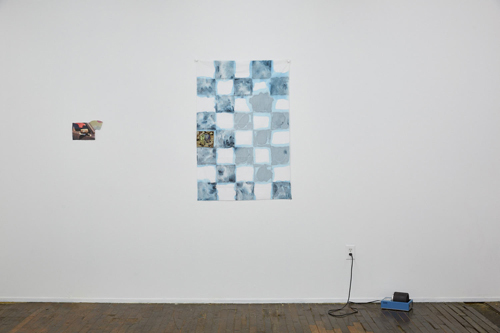 Seeking out the graveyard on your opponent’s side, which otherwise may have gone completely ignored, analogizes the act of collecting demonstrated by each of the exhibiting artists. 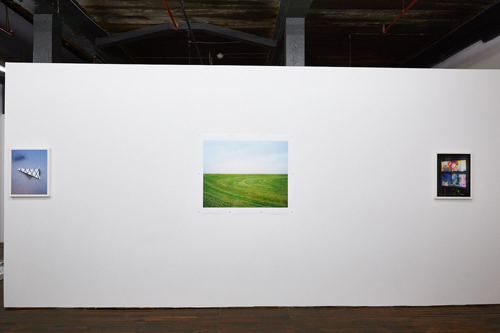 While the game proposed in Silos, Windmills, Graveyards may conjure images of rural expanses, as in Izaak Schlossman’s large photographic print Mowed Grass, New Orleans East, LA, many of the works engage the treasures of an urban environment. On the surface, Mowed Grass gives the impression of the horizon line as viewed from a passenger window on the Interstate, but upon further inspection, the suburban location at which the photograph was shot tells a different story. 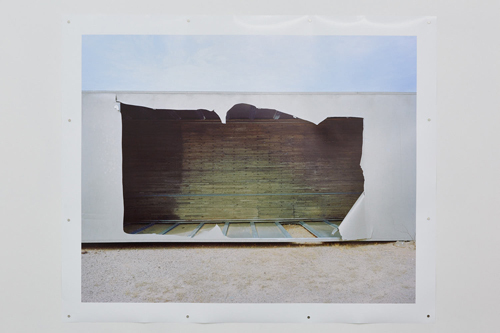 The mediated nature of photography allows for this transformation of material and space, which is a common thread amongst the artists exhibited. Matt Kayhoe Brett’s large floor piece, displayed on a “plinth” of an unconventional, non-gridded sheet of peg-board, is a collection of molded, plastered, painted, and carved sculptures which blur the line between earth matter and man-made objects. A tumbleweed of steel wool collected from the floor of the artist’s studio reads of organic origin, while a pizza box fused to a large bone and coated in metallic silver comes across as acutely alien. Kayhoe Brett bends the margins of each item’s functionality to render them curious and imaginative. 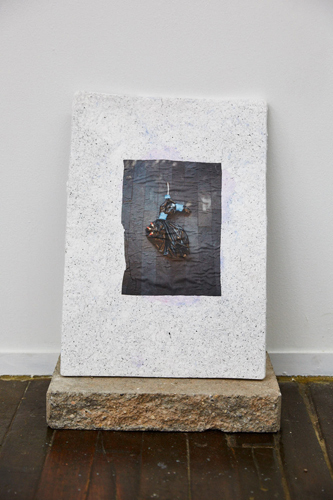 Sophia Belkin’s sculptures made of clay, fibers, and readymade objects allude to fragments found in city streets, but distance themselves from their referential origin by existing in the space as photographs printed on fabric. The flatness of photography and the textured thread of cloth further mediate our experience with these objects. Belkin’s use of fiber is unique, making the medium describe materials and textures other than itself. In I Said To Her/ I Heard It So, a photograph of a hanging assemblage is adhered to a speckled, fibrous block, resting atop a tablet of stone. The fiber’s textural mimicry of granite immediately elevates the piece from merely two rectangular slabs to the powerful momento-mori of a headstone. Each of the works successfully expresses moments of distinct, visual experience by framing, abstracting, translating, and obscuring their original references. The marriage of photography and sculpture in the space makes clear the homologous nature of mold making, drawing, sculpting, and photographing as processes which have the ability to document lived experience. In the case of Clark Mizono, whose photographs document traces of human activity in public space, the images call attention to the expressive mark making of everyday actions, and the surfaces and structures that pattern and frame our visual field. 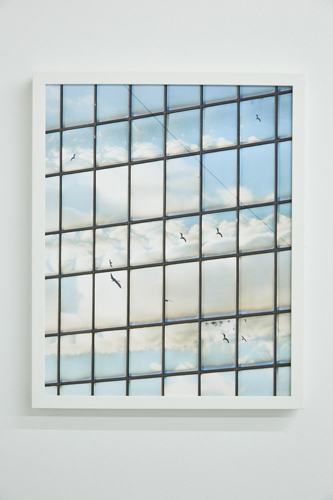 Thick panes of glass and a heavy grid of window molding abstract a photograph of airbound birds in a sublime view of the sky. Mirroring this image across the room, a tear in a soft blue plane of thin plastic exposes the similar grid of a chain-link fence. 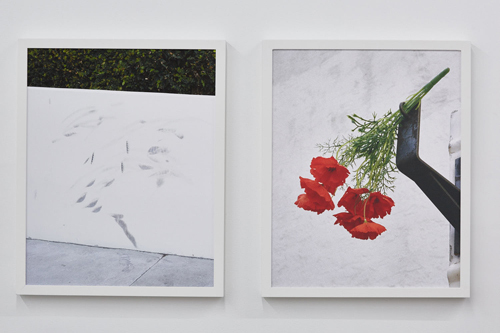 Through frequent mirroring, the placement of sculptures and photographs in the space calls attention to the transformative act of making openings. Schlossman’s photograph Overturned Truck Trailer, I-8 Near Yuma, AZ reveals a monstrous gape in the ceiling of a semi-truck trailer on its side. The image keenly looks out over Kayhoe Brett’s smaller floor piece: a thick panel of felt, which in both color and contour seems as though it could perfectly mend the trailer’s opening, sits beneath a collection of handouts from a business meeting which have been cut into paper snowflakes. Although varied in material, texture, and form, the work exhibited is visually unified by thoughtful placement. A “boneyard” of hand-drawn dominos frames a photographed arrangement of sculptures printed on fabric in Belkin’s wall-hung work Boneyard. 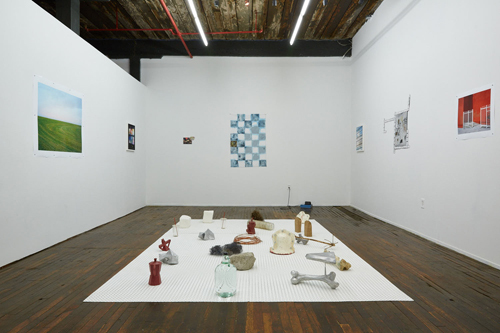 The carefully considered arrangement of objects in the photograph recalls Kayhoe Brett’s floor piece. 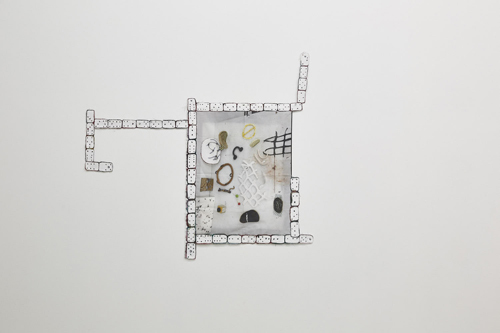 Further, Kayhoe Brett’s sculptures are framed by a white plane of black dots reminiscent of Belkin’s boneyard of dominoes. 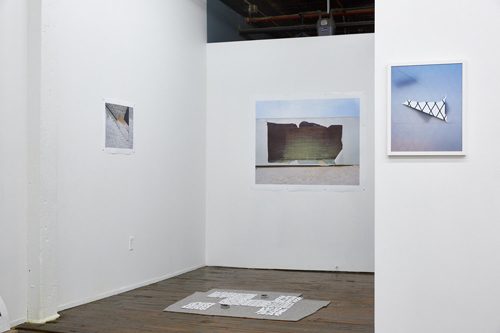 While the visual and conceptual similarities between the four artists exhibited in Silos, Windmills, Graveyards are impactful, their presentation under the guise of a road trip game brings to the forefront their shared emphasis on processes of transformation and their tendency to unearth treasures of the mundane. Silos, Windmills, Graveyards is an allegory for the process by which the artists create their work – continuously scanning the horizon line for objects and spaces of curio.